The first time I made this Garlic Parmesan Kale Pasta I chose to use whole wheat pasta because I felt like the nutty whole wheat flavor would go really great with kale’s earthiness. Whole wheat pasta with kale may sound like the most boring, torturous diet meal of all time, but when you lace them with garlic, parmesan, and a little butter, they take on a whole new personality. Add a pinch of crushed red pepper flakes if you’re feeling sassy and it’s like pasta heaven. Sometimes whole wheat angel hair is hard to find, though, in which case you can just use regular. Either way, I do suggest using angel hair pasta rather than other shapes because I find that the thin texture really balances the mouthfeel of the dish. 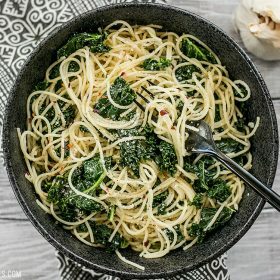 This Garlic Parmesan Kale Pasta recipe makes four side dish sized servings, but you can bulk it up and make it a meal by adding a chopped hard boiled egg (or topping with a fried egg, like I did), adding some chopped fresh tomatoes (or sun dried), or even crumbling some bacon over top. This is just a starting point and it can go in about a million different directions. Have fun with it! When you're in a hurry, this Garlic Parmesan Kale Pasta is a filling and flavorful meal. Few ingredients, BIG flavor. Pull the kale leaves from the woody stems and tear them into small 1 to 2-inch pieces. Rinse the torn kale well in a colander under cool, running water and allow it to drain. Bring a large pot of water to a boil. Break the pasta in half, add it to the boiling water, and cook until al dente (about 7 minutes). Drain the pasta in a colander. While the pasta is cooking, add the olive oil, butter, and minced garlic to another large pot or skillet. Cook over medium heat for 1-2 minutes, or until the garlic is soft and fragrant. Add the kale and continue to sauté until the kale has wilted and has turned a deep green color (about 5-7 minutes). Turn the heat off. *Whole wheat pasta goes very well with this dish. 0 Response to "GARLIC PARMESAN KALE PASTA"